I've got a 1982 Trek 613 that has an Atom rear hub (not a helicomatic hub). Presently, this is a 6-speed. I want to change the freewheel and I am wondering what threads I would be needing. 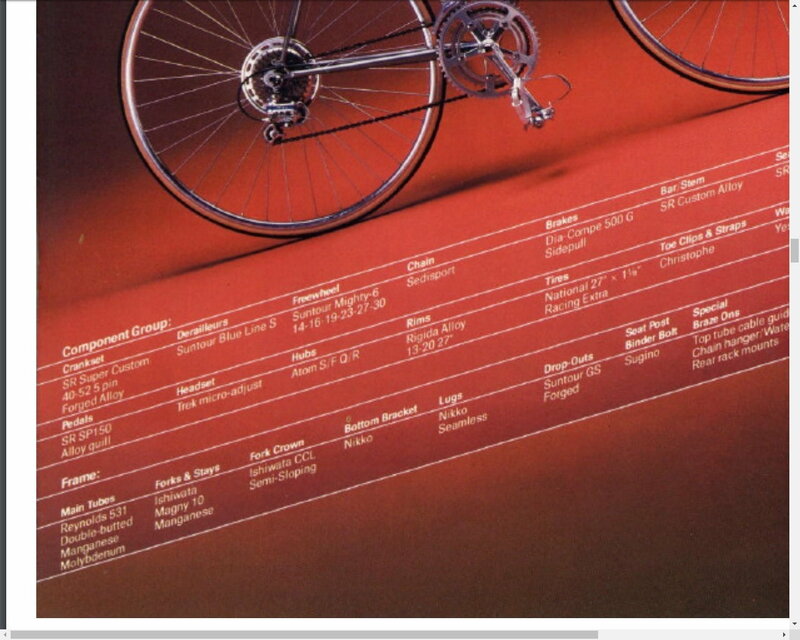 The Trek brochure indicates that the hubs were originally mated up with a Suntour Mighty-6 freewheel. Thinking I would replace the 6 speed freewheel with another 6-speed or move up to 7 speed. 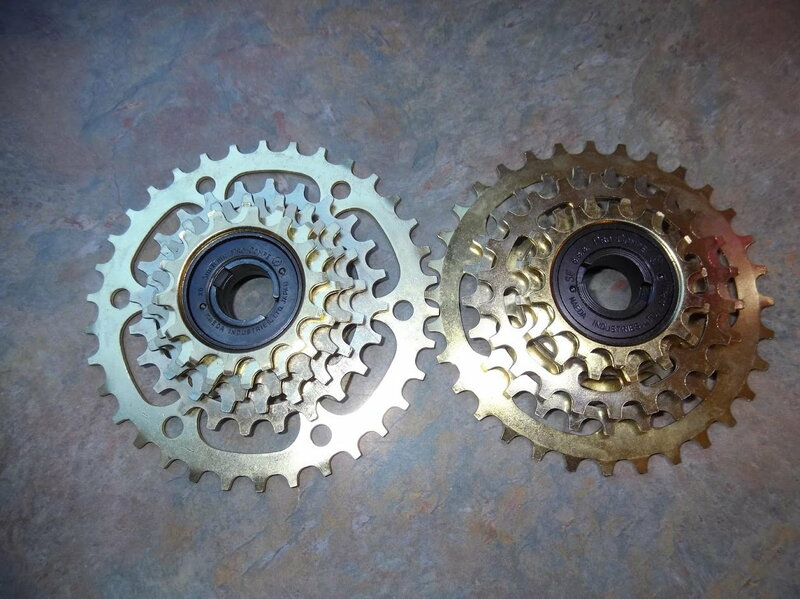 Could I look for any Suntour freewheel, like a Winner or Winner Pro or New Winner? How about, Sachs, Regina, etc.? Just don't know what kind of threads would be on a French hub. Thanks for any info. Its possible it doesnt have french threads. The best way to determine the hub threading would be to examine the current freewheel. Most freewheels are marked if they are other than their native threading. Maeda stamps the notched removal barrel with an "M" or "Metric" if it is French threaded (see photo). If not marked as such, Maeda freewheels are their native English threading. I'd be surprised if Trek ever shipping a bike with a French threaded freewheel. Very surprised. This is one of those situations where it comes in handy to have too many bikes and too many freewheels on hand. Otherwise, a known, English thread bottom bracket lockring will thread onto an English thread freewheel hub, but not onto a metric thread freewheel hub. Last edited by JohnDThompson; 03-16-19 at 01:17 PM. I'd grab a Shimano freewheel and grease everything up real good first and then very gently try to thread it on the hub. Completely back it off if there's any resistance at all. Or, clean the threads on the hub. Get a magnifying glass. Put a 1" mark on it & see if you can count 24 threads or something. Or, just chunk it in the trash & buy a new set of wheels on sale for $125. +1 on the no French threads on Trek. Everything else they had was BSA, why muck up the supply chain with parts of a different standard? Helio hubs were a different matter....there was an end user reason that they spec’d those hubs. I can't say I've ever heard of a "Suntour Mighty" freewheel. Has anyone else? Try a Sachs Aris 7 speed freewheel. I suspect he meant "Ultra-Six." I haven't heard of a Mighty-6 freewheel either but in the OP's defence they were simply quoting from the Trek literature, where it states this freewheel in multiple places for several models. It must have been one of those days when JDT was injured and assigned to vet catalogue copy. Thanks to everyone for all the feedback. I am thoroughly satisfied that the threads are not French or some other weird thing. I have several nice Sachs freewheels and I am going to go that route first. Here is the page in the Trek catalog that references the Suntour Mighty-6 freewheel. Thanks for having my back, T-Mar! I wonder if "Suntour Mighty-6" shouldn't have been "Suntour Maeda-6?" And while this is a guess and I'm hoping someone familiar with Japanese can chime in, can "maeda" be defined as "mighty" or "strong?" 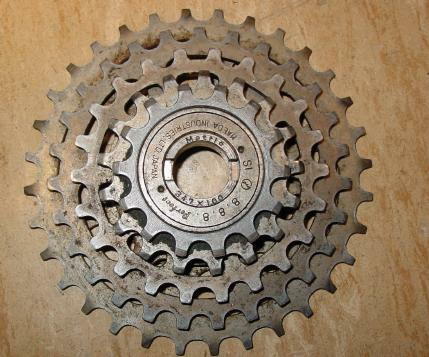 Based on the 14T small sprocket my guess is this was either a Perfect which @T-Mar pictured above or a ProCompe which sometimes came stamped as "Suntour and Maeda" or just "8.8.8. and Maeda." I bought an '82 613 new, and remember the "Mighty-6" reference in the catalog (wish I'd kept the paper copy). IIRC, it was a Perfect that it actually came with.